This plea came from a Knitting Nuggets Newsletter reader. Not surprising, really. If there’s anything many of us knitters could use, it’s more knitting patterns for babies! Whether we need them for baby gifts (I feel like at least once a month, someone in my life gives birth!) or for charity projects, we can really never have enough knitting patterns for babies. So this is the start of a baby knitting pattern series. The posts in this series will offer nothing but baby knitting patterns. They will comprise very simple patterns; that is, great for beginning knitters or for experienced knitters who want something to relax or watch TV with. They will also feature more complex patterns, for those who want to challenge themselves or for knitters who get bored easily. Let’s start with baby hat knitting patterns! Baby hats… sigh. They’re so precious. Whenever I knit a baby hat, I feel the wonder of taking part in that baby’s first days or months. My own children are well past the age of baby hats, so creating a tiny hat is the next best thing to having a tiny baby in my home again. Basic Baby Hat: Baby hat knitting patterns don’t get any easier than this. It’s a simple stockinette pattern that ends with a little bit of ribbing at the bottom. Sizes are given from preemie to teenager, so you can whip up a bunch of these hats for charity, or make one for nearly any child in your life! Simple Baby Hat: A hat pattern very much like the preceding, only it makes a roll-brim design rather than a ribbed-brim. Sizes include preemie to toddler. Preemie Hats for Charity: One pattern with five variations, including hearts, diamonds, eyelets, stripes, and ribs. This is a terrific stash-busting pattern as well. Newborn and Preemie Hats for Charity: These are simpler baby hat knitting patterns with simple stockinette stitches and ribbed brims. What makes this pattern unique is its two variations. 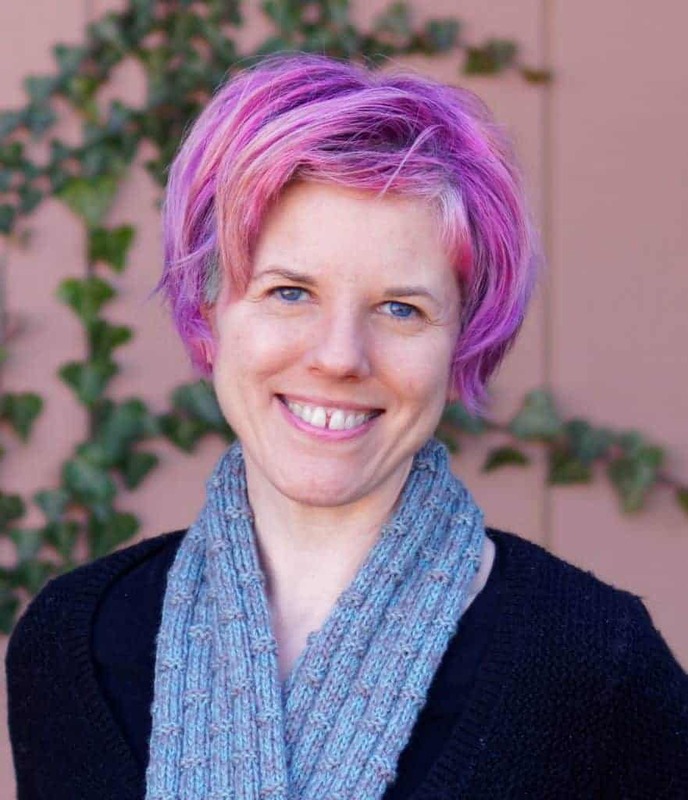 A beginning knitter who wants to knit for charity can knit it flat. A more advanced knitter who wants an easy pattern to whip off the needles quickly can knit it in the round. Little Flower Hat: This is my go-to pattern for baby girls. It results in an adorable flower at the top of a ribbed-brim hat. It knits up very quickly and is much easier to knit than it looks. Swirl Hat: This is the most popular hat knitting pattern in all of Ravelry! For good reason, too: it’s easy, adorable, and can be knit for absolutely anyone, from preemie to adult. Little Boy Blue Ribbed Hat: Just as the name suggests, this hat for babies has ribbing from top to bottom. Though it is made for newborns, the stretchy ribbing means it will continue to fit for months! Eyelet Baby Hat: This precious little hat features a zig-zag eyelet pattern. It offers sizes from preemie to 12 months. Vintage Pique Rib Hat: This is a pretty, fun pattern that looks more complex than it is. It’s a variation of a simple ribbing that creates an interesting nubby texture. Oisín Hat: Here’s a fun pattern with stranded colorwork that’s a little more interesting (and a little trickier) than just a striped beanie. Cabled Baby Hats: Both of these gorgeous hat patterns feature cables that extend all the way around and across the hat. Staggered Cable Baby Hat: Another pattern with cables all around the hat. These cables resemble swirls of soft-serve ice cream. So cute! Striped Baby Beanie: The vertical chunks of color make this striped beanie a little bit more challenging than the typical striped baby hat. Checkered Band Hat: Here’s a hat with an adorable colorwork checkered band. You can make this hat with either a rolled brim or a ribbed grim. Train Track Baby Hat: Just as the name suggests, this cute pattern features a train track image toward the top. It requires a little colorwork, but the effort is worth it! Free Smoothfox’s Got Milk? Knit Pattern: You want cute? This hat is ridiculously cute, with its “Got Milk?” message embedded into the hat. Baby Bows Cap: This hat isn’t terribly difficult, but a little trickier than most. The pattern creates adorable little gathered bows in the body of the hat. You can knit this pattern either flat or in the round. Grace Beanie: This precious cap pattern features hearts that circle around the hat. You can leave the eyelet designs as is, or for added flair, you can thread contrasting yarn through the eyelets. Angel Lace Baby Cap: Here’s a breathtaking pattern that produces tiny lace angels all around the cap. Snowflake Baby Preemie Hat: I’m really proud to offer this pattern, because the person who designed it is the reason I am a knitter today. It’s a beautiful pattern that features a gorgeous snowflake motif. 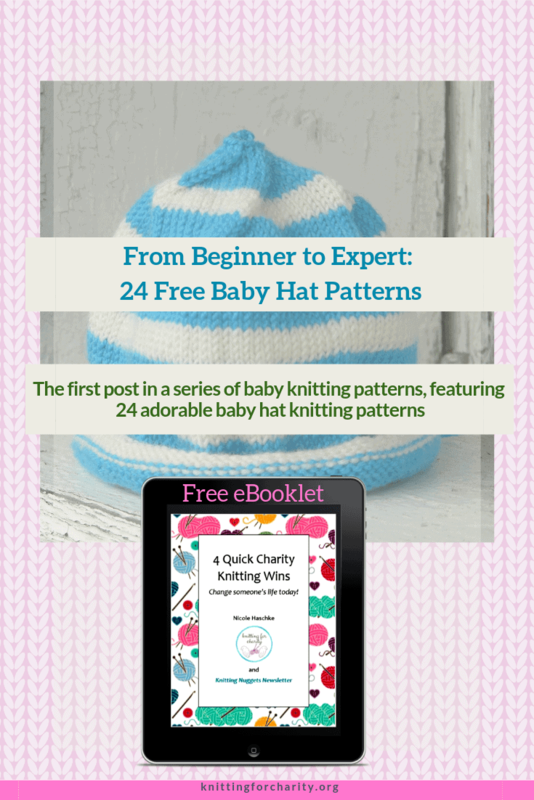 I hope you enjoy this series of fantastic free baby hat knitting patterns. And I hope within this list, you’ve found many different knitting patterns for baby hats that you want to knit! Next in the series: Knitted Baby Booties! Can’t find the pattern for the pic – blue & white with stem or slight point on top? Name of pattern? N, that photo didn’t come from one of the patterns — that’s just a photo I found to illustrate the article. However, you could easily make a hat like that with one of these two patterns: http://www.ravelry.com/patterns/library/two-by-two-basic-beanie (just use a regular stockinette edge rather than the ribbing, to make it roll at the brim) or http://www.simplynotable.com/2015/super-stretchy-baby-hat/# (same, and at the top, instead of knitting 20 rounds after decreasing down to 6 stitches, just knit maybe 2 or 3 rounds to create that tip). Hope this helps!